TORONTO -- The Ontario legislature voted down an attempt to prevent the provincial government from doing business with companies that support the boycott, divestment and sanctions movement against Israel. Liberal MPP Mike Colle and Progressive Conservative Tim Hudak jointly presented the private members' bill, with Hudak calling the BDS movement "the insidious new face of anti-Semitism." But without the support of any other Liberals -- nor the NDP -- the bill failed to pass second reading Thursday. Premier Kathleen Wynne, who is in the midst of a trip to the Middle East, said in Israel this week that she opposes the BDS movement, but supports free speech. "So taking this position, as I would take any position against something that promotes homophobia, that promotes sexism, that promotes islamophobia, if we are going to have a world that is capable of supporting humanity then we have to find a way to stand against all of these positions," she said. "I support all rights to freely express their views, freely expressed without fear of discrimination or persecution, whether in Ontario or in the Middle East. Freedom of speech is something that all Canadians value and we must vigorously defend. But, it's unacceptable for students, or parents, or children to feel unsafe or discriminated against." The NDP said it didn't support the bill because they believed it infringed the right to free speech. The New Democrats and Liberal members said there are already ways in law and human rights codes to fight hate speech and racism. "Free speech is a basic right that makes our democracy what it is," said New Democrat France Gelinas. "When you take that away, nothing good comes of it." Hudak slammed the Liberal and NDP members for not supporting his bill. "Look, if somebody said they weren't going to buy from a business because they owners were gay, you guys would go crazy," he told the legislature. "If somebody said they weren't going to buy from a business because they came from Pakistan or they're Sikh, people would go nuts. But somehow because they're Jewish or from Israel, oh, it's free speech all of a sudden? Come on." 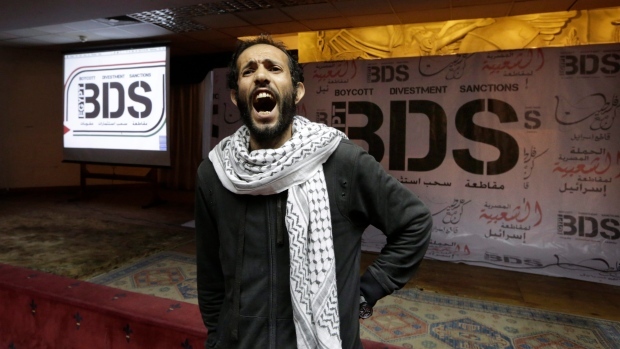 Supporters of the BDS movement say its aim is to non-violently challenge Israel and does not target Jewish individuals, nor is it anti-Semitic. Tyler Levitan of Independent Jewish Voices Canada, one of several groups that released a statement condemning the bill, said it infringed on the right to free expression. "We feel that any kind of political imposition from the government to try and silence people from engaging in these kind of non-violent grassroots initiatives are really an affront to our democracy," he said.